Urine Has Amorphous Urates, What's the Matter? What Are the Functions of Nephron? The nephron is the basic functional and structural unit found in the kidneys. Its main functions include regulating the concentration of sodium salts and water by filtering the kidney’s blood, excreting any excess in the urine and reabsorbing the necessary amounts. It also regulates blood pressure and volume, controls the levels of metabolites and electrolytes and helps eliminate waste from the body. Each kidney usually has between 800,000 and 1.5 million nephrons. The main functions of the nephron are related to filtering, reabsorbing and secreting glutamate, carbohydrates and solutes. The glomerulus has two cell layers as well as a basement membrane that separate it from the Bowman’s capsule. This basement membrane contains collagen and glycoprotein fibers. These fibers have a mesh-like structure that uses ultrafiltration to filter the blood. Although the smaller molecules in the blood are able to pass through this membrane, larger molecules such as blood cells and proteins cannot. This process removes around 70% of the solutes and water from a person’s blood plasma. It also filters some useful substances including amino acids and glucose but selective reabsorption allows the body to reabsorb them and keep the electrolyte levels balanced. After the fluid is filtered, it goes into the proximal tubule where it is reabsorbed into the peritubular capillaries. This is the point at which any essential substances (such as ions, amino acids, vitamins and glucose) get transported back to the blood. The numerous microvilli increase the surface area, making absorption more effective. While the substances are re-added, the solute concentration found of the blood in these capillaries increases. This means that a great deal of water must go back into the blood while in the proximal tubule using osmosis as this will balance electrolyte levels. The loop of Henle concentrates the salts which are added to the urine for excretion, creating a high solute concentration found in the medulla. The limbs of this loop of Henle are able to reabsorb certain solutes, water and ions due to their permeable nature. 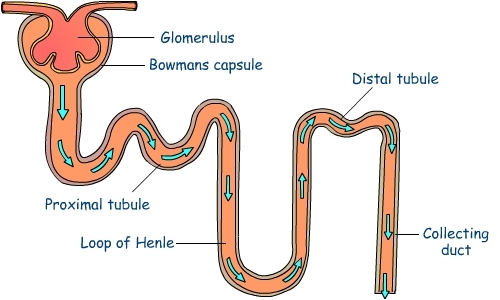 These substances are reabsorbed from the area in the collecting ducts which go through this area of the nephron. The ascending limb is highly permeable to salts than water so during the absorption of these salts, more water exits the descending limb which in turn creates concentrated urine. This substance is then drained so that it enters the distal convoluted tubule, a feature which is responsible for maintaining balanced pH levels of both blood and urine. After this, the fluid continues on its way to the collecting duct for another process of ultrafiltration before going to the ureters followed by the bladder. Now you know all about function of nephron.